Week 30: Words, Hares and Hepworth. Another week goes by. We were pleased to receive a grant from Cumbria County Council Community Fund. The panel met on Monday and Mat gave a brief description of our needs and answered questions about how the money would be spent. The very hot weather has been difficult for many of our service users and even with fans and ice many of the venues we use were really hot. That did not stop the creativity though. Some very interesting work emerged when we used words to create art. Some using the images to express very personal feelings and emotion. As always our relationship with Lakeland Arts Trust was showing the benefit in our great visit to the Barbara Hepworth exhibition on Friday. Some amazing pieces very well displayed that clearly inspire the WellArt group who will be producing work based on this visit in coming weeks. The group were inspired by words again. This time the group were taking and image and then creating it from words on that image. The words used were sometimes about the image and some were not. One participant had just finished her acrylic piece on canvas too. Continuing the theme from Tuesday’s session, participants on the ward were invited to draw and fill a prepared outline, or just to create a shape or landscape using words. These could either connected to their chosen shape, or could just be significant to them personally. A varied and striking set of images emerged. In today’s session, as with every Thursday, it was a completely unique and individual time. Some individuals brought items they were working on and others started new projects, from needle felting to drawing, sketching, sewing, hooking and puppet making – even a blind to hang in the doorway was started. The array of talent and ideas made for a vibrant and very supportive session. The DeafArt group were decorating masks. Using ready made bases they added layers of acrylic paint and then some extra decoration from a selection of materials. WellArt visited Abbot Hall Art Gallery this week to view the Barbara Hepworth exhibition. Anne-Marie the Engagement Officer gave us a great tour and explained many of the sculptures as well as the life of Barbara Hepworth. The sculptures ar…e really tactile and although you can’t touch them, nearly everyone in the group expressed the desire to stroke and feel the surfaces. After looking at the exhibition the group then started some soup carving inspired by the work of Hepworth. Most of the group took theirs home to finish them so we only have one to show! A great visit. Week 29: Sentence inspiration, apples and pears, modroc and laughter. There seems to have been a lot of laughter this week at the sessions despite some members having had some accidents. A large number of crutches appeared but the best relief as always is a good laugh with friends while creating. Next week the WellArt group will be visiting Abbot Hall Art Gallery to see the Barbara Hepworth exhibition. They have been preparing with some sculpture work already but we will be drawing inspiration from her work over the summer. Last session for a while but a really enjoyable one. We started playing a verbal game building a story. We then wrote questions and answers, shuffled them randomly and recombined them to make interesting combinations. We then selected one of these to do a piece of writing on. We also played one or two more word games that resulted in poems. A good session with plenty of laughs and some great writing. In the long afternoons out at sea. “Up the Orinoco my love?” Gertie said slipping on her gloves. “Like the sea birds in the skies my dear?” Gertie said starting to warble a tone pure and clear. “Aargh!”, intoned Gertie with passion, adopting a piratical tone. “Oh Gerald how daring!” lied Gertie who found tennis most wearing. Today the group generated some random questions and answers and used the unusual answers to inspire a creative piece. Some people finished off canvas pictures or did their own projects too. On the Ward the group but in a range of media. Looking at apples and pears they created images using collage and pastel. It is difficult to capture the sense of shape on a flat piece of paper but the group made a good start. In the session, everyone worked on pieces they had previously started. We discussed that it is sometimes good to have a project that runs over a few weeks because you can arrive at the session knowing what you are going to do and then g…et started immediately. As the photos show, there was a varied array of activities: modroc figures (which will be made into puppets); needle felting; lino printing; embroidery and comic art. The session was, as always, lively, productive and supportive. Some of the group worked on finishing their sculptures. We had looked at reducing figures or objects into simple forms to create modroc sculptures. This was done by wrapping masking tape round screwed up newspaper to get a basic shape then adding modroc over the top. Others were working on watercolour sketches. We had hoped to go out around the grounds of Abbot Hall but the thunderstorms and downpours restricted that a bit. Week 28: Simple lines, Modroc and the sculpters touch. 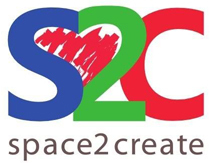 This week has been great to see al the Service Users at Space2Create pull together to help when we have been a little short on our main volunteers. What could have been a very stressfull week has turned into a very creative one! As the week went on, we started with simple drawings then moved towards sculptural 3D work. Another fun writing session with Ann The Poet. We had some great ideas and lots of laughs. We wrote short pieces from the viewpoint of an animal and then wrote poems based on using a repeating time related phrase. We finished of using a randomly generated list of words to randomly throw together sentences which gave us all a good laugh. Next week, 14th July will be the last for a while unitl end of August. Today the group took inspiration from a book called “Grand Gestures” by Simon Moreton. We loved the really simple forms used to tell the story. We had a go at creating drawings using very simple line. We then expanded on this looking how we could develop the lines by adding thickness in curves and rounding edges where two lines met. A very interesting and experimental session. This session took some inspiration from the work of Barbara Hepworth and Henry Moore. We started with a warm up task drawing curved shapes. We then looked at taking an image then reducing it down and simplifying it. We then used this sketch to create a £D piece. this was done by constructing the basic shape in paper and masking tape and then using modroc around the outside to form the sculpture. A good relaxing session for all involved with many different project being worked on. One person worked on creating a mask in the style of an apothacry from 16th century Italy. There was some sowing and needlework projects and rag rugging to. Some nice felting continuing to finish off pieces started in previous sessions. A mixed bag of different work from simple line drawings to more colourful efforts using paint trails to enhance the images. In the Kentmere Ward session the group were influenced by the work of comic artist Simon Moreton who uses very simple lines to tell stories as the 2Create group did on Tuesday. Each session being unique this evolved and individuals went on …to create patterns, add their own ideas to the examples we brought to draw freely. The session was simple in it’s format enabling everyone to chat, support and share ideas. The outcomes show how productive and creative we all were. Week 27: Meetings, mixed media and masks! This week started with a meeting hosted by the Cumbria Voluntary Service for groups which had received NCIS funding. This was a brilliant meeting in which all the groups shared the fantastic work they had been doing with the funding. It was also a great chance to make connections and links to each other so in future we can support each others work. Two sessions stand out to me this week for the same reasons. 2Create and WellArt. Both with very high attendance (to the point of bursting!) and both where and idea was put to the group and everyone there picked it up and ran a very long way with it. It is so good to see people who had no confidence and needed step by step instructions start to feel untethered and able to set off on their own creative journeys. In 2Create the group were looking at mixed media. We looked at examples and then the group set to with a whole range of resources. Being the creative bunch they were there were soon bits of allsorts being collected. We had talked about mixing text into the piece and having a theme. Ant was drawing too and Chris was in Comic Art Festival mood working on his comic strip. On the ward, we used air-dried clay rolled out thinly, and then pressed wild flowers, grasses and leaves into it. We also rolled lace into the clay to create texture, and then cut out stars, hearts and fish which could then be painted… and varnished later. This clay is very easy to use and doesn’t need to be fired, but will dry hard very quickly. The session also enabled the participants to chat and laugh whilst creating, and this made the session very inclusive and enjoyable. In the DeafArt session Ant showed the group how to create these colourful images. A layer of colour covered by black crayon which can then be scratched away to leave an image. In the session, some of the participants just wanted to talk, watch others creating and look through books for inspiration. This made for a calm and relaxed atmosphere. We also decided to look at marionettes, and to see if we could crea…te our own. Using newspapers to shape the head, body and limbs, we then started to cover them in modroc. Watch this space to see them progress!! Others in the session drew and sketched, sewed and even created a beautiful flag. A varied and supportive session. Dana led the session. mWe used prepared masks, some whole face and some just eyes. We then applied a layer of acrylic decoration. When this dried we applied various decoration such as glitter, feathers, ribbon and coloured patterned paper. The masks look great and look even better all together.